The most prominent enterprise that has existed within the Morton Building was the Morton Theatre, which opened on the evening of May 18, 1910, with a piano concert by Alice Carter Simmons of Oberlin, Ohio Conservatory, attended by both black and white patrons. This historic event was celebrated during the Centennial Anniversary of the Morton Theatre with a classical piano concert on May 18, 2010 by Dr. Rosalyn Floyd, featuring many of the same pieces Alice Carter Simmons played in the first act to ever grace the Morton stage. Unfortunately, there are very few existing copies of local black newspapers from the period when the Morton Theatre was first being performed in, making it difficult to document any performances that were rumored to have occurred with any reliable degree of continuity. However, an occasional article or ad in the white press has provided sporadic and fragmented information about several particular performances. Time has faded the memory of many who could recall events which took place in the Morton. Of course possible social stigma attached to the type of acts could also prevent others from relating some of the zany vaudeville performances we know were a large part of the Historic Morton Theatre's repertoire. Ticket stubs have been found within the theatre from such great performers as Duke Eliington, Louis Armstrong, Cab Calloway, Jimmy Lunceford, and Bessie Smith. However, these old ticket stubs only show the event name, and not the date and location, so they may be misleading. However, there are well documented performances from the Morton Theatre's historic days, including the New York Follies performance in 1914, and the "annual" appearance of The Black Patti Musical Comedy Company on November 2, 1914. Also appearing in November 1914 were Shark's Smart Set Company and Tolliver's Smart Set Company who graced the Morton's stage "with a thiry all-star cast--carrying the best lines of singers, dancers, and novelty acts of any company on the road." 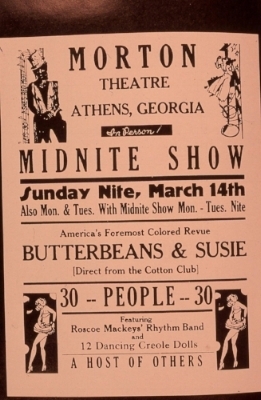 There is also a hand-bill from 1927 advertising the Butterbeans and Susie Review featuring Roscoe Mackey's Rhythm Band and 12 Dancing Creole Dolls, which indicates that the act was "direct from the Cotton Club." Georgia-born Jodie "Butterbeans" Edwards and his wife Susie were a headline act for forty years, and perhaps the most popular husband and wife act in the business. They toured for many years on the Theatre Owners Booking Agency (TOBA) circuit. In all probability, though this has not been confirmed, many of the acts which appeared in the Morton would have been booked through TOBA, which was a well-established performance booking agency of the time. The Morton Theatre was also host to local and regional blues performers. Some of those confirmed performances were by Blind Willie McTell, Curley Weaver, and Roy Dunn. The most vivid documentation of individual performers who visited the Morton has been found in the graffiti scrawled on the backstage dressing room walls. In chalk, Bob White's Dark Town Swells recorded their appearance in the Morton on April 1 I-29, 1919. In paint, Charles "Fats" Hayden left a lasting record of his 1923 appearance. Joe Johnson's Brown Babies apparently got an extension of their engagement in June 1931--their appearance was recorded in pencil on the back of a dressing room door with "3 nights" scratched through and changed to "6 nights." Monroe Bowers Morton, Jr. recorded his position as "switchboard operator" in now-faded paint on a backstage wall. Other undated names found painted on backstage walls include: Rags Honey Troupe, Nora B. Johnson, and Eva Reese as well as a very graphic statement about smoking regulations and their steep punishment. The piece of wall featuring the statement about smoking regulations with their fines and punishments is now displayed in the museum area in upper lobby, along with two of the original seats, a white-washed metal filigree wood burning stove, the original theatrical lighting system and other artifacts from the original days of the Morton Theatre. The history of the Morton Theatre is the history of many obscure, unassuming men and women who performed here, as well as the history of those performing greats who became household names. Of the many performers who have graced the stage, nothing remains as evidence of their talent and still except a few faded photographs or a few brief minutes of a scratchy phonograph recording made fifty years ago. Though the list of performances and events held within this historic space is far from complete, and may very well never be completed; we will never stop trying to find out more about the performances and events that have cemented the Morton Theatre into a special place within the Athens community.